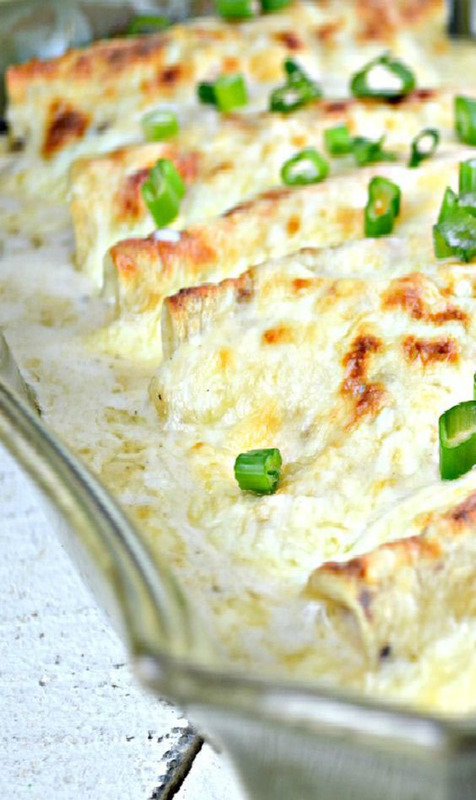 Amazing White Chicken Enchiladas with Homemade Sour Cream White Sauce–No Soup. It is easy to make and off the charts delicious! Everyone in my family loves it! I could serve it 7 days a week and there would be smiling faces all around the dinner table if I was serving it. But these enchiladas are even better than regular Mexican food. Well, of course, Yes, they are indeed Mexican inspired food, but imagine the best, most delicious imaginable, super creamy and Cheesy to boot, Mexican food!!!!! Rotisserie Chicken: I used a rotisserie chicken in this recipe. I love that the chicken has lots of flavors and the convenience factor is huge for me. Tortillas: The recipe calls for using flour tortillas, but if you prefer, you can switch them with corn tortillas. I used fajita sized tortillas. Green Chilies: I used mild green chilies because my hubby is a wimp when it comes to spice. I buy the canned Ortega chilies already chopped. Feel free to spice up your dish by adding spicy green chilies instead of the mild ones. If you like it really spicy I’d consider adding a second can. Seasoning: I didn’t need to add any salt or pepper to this recipe. The chicken broth I used was very flavorful and had a lot of salt already in it. The chicken was also well seasoned and obviously, the cheese had a good amount of salt. Spray a 9 X 13 inch baking dish with cooking spray and set aside. Preheat oven to 350 degrees. In a small bowl, combine chicken and 1 cup of Monterey Jack cheese. Fill tortillas with this mixture and roll each one up then place seam side down in prepared pan. Get full recipe and instructions, please visit here gonnawantseconds. 0 Response to "White Chicken Enchiladas With Sour Cream Sauce"